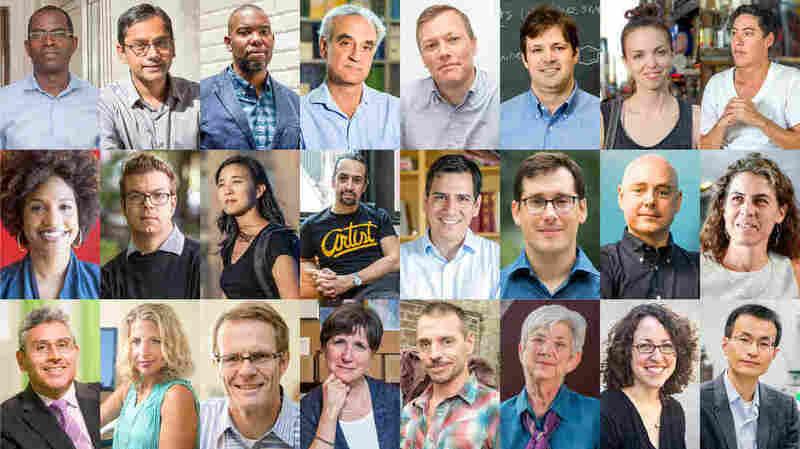 Journalist Ta-Nehisi Coates Among 2015 MacArthur 'Genius' Award Winners : The Two-Way Representing fields from chemistry to poetry, the 24 MacArthur Foundation Fellows will each receive $625,000 over the next five years. "When I first got the call from the MacArthur foundation I was ecstatic," Coates said in a video on the foundation website. The national correspondent for The Atlantic, who writes about racial identity and systematic racial bias, added, "You know, if anybody even reads what I'm doing, that's a great day." The fellowship recipients hail from a variety of fields including music, photography, biology and economics. Each will receive $625,000 over five years to continue his or her work or pursue something entirely new. Many of this year's winners have been covered by NPR at some point in their careers — most recently, playwright, composer and performer Lin-Manuel Miranda was the topic of discussion last week on All Songs Considered. Additionally, writer Ben Lerner's books have been reviewed by NPR's Maureen Corrigan, urban sociologist Matthew Desmond was a guest on Tell Me More in 2010, computational biologist John Novembre appeared on Morning Edition in 2011, education entrepreneur Patrick Awuah was featured on Ted Radio Hour in 2012, Twist was interviewed about his abstract pupeteering in 2012, and Coates was interviewed in July on Fresh Air about his book. "For me, my camera has been that catalyst for me to really look at these situations head on and not flee from them," Frazier said of her work documenting social inequality and historical change in her hometown of Braddock, Pa. Frazier was also featured on NPR's CodeSwitch blog in May, talking about her book, The Notion of Family. Mimi Lien, 39, New York: "Set designer translating a text's narrative and emotional dynamics onto the stage in bold, immersive sets that enhance the performance experience for theater makers and viewers alike." Lorenz Studer, 49, New York: "Stem cell biologist pioneering a new method for large-scale generation of dopaminergic neurons that could provide one of the first treatments for Parkinson's disease and prove the broader feasibility of stem cell-based therapies for other neurological disorders." An earlier version of this post stated that the grant winners receive $500,000. They receive $625,000.